Save 30% on Nori Ubukata Mai Tai Preset Collection! 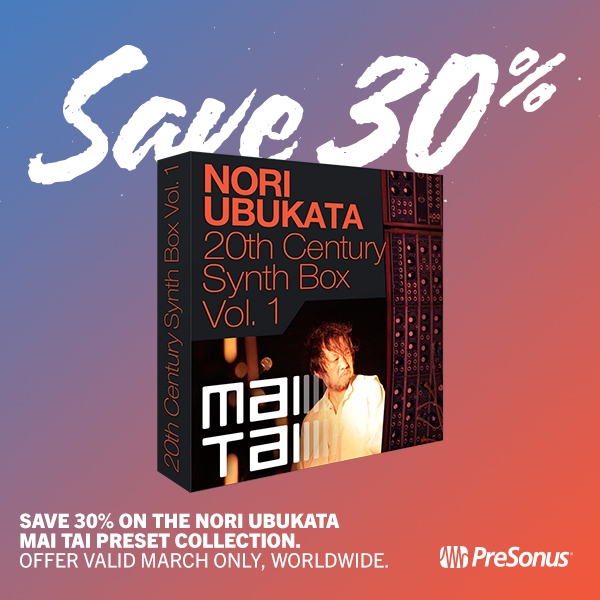 Starting today SAVE 30% on the Nori Ubukata Mai Tai preset collection right out of the PreSonus Shop! Take a trip back in time with Nori Ubukata’s 20th Century Sound Box and rediscover the legendary analog sounds of the 70s and 80s. Famed Japanese sound designer and synth/theremin artist Nori Ubukata recreated some of the most memorable sounds by electronic music artists such as Kraftwerk, Tangerine Dream, Vangelis and Wendy Carlos. The set contains a total of 111 presets and Instrument+FX presets (adding reverb, EQ and other effects). Also included are 50 Musicloops with sound elements showcasing the best presets in musical context. Posted in Promo / Discount, Studio One, Uncategorized | Comments Off on Save 30% on Nori Ubukata Mai Tai Preset Collection! Tweets about "#Favorite Tweets by @PreSonus"
Copyright ©2019 PreSonus Audio Electronics, Inc. All Rights Reserved.